Stephen King is a household name. From his dozens and dozens of New York Times-bestselling novels to the innumerable movie adaptions of his work (Children of the Corn 7. I'm not kidding. And a eighth in production, plus a sci-fi channel remake), the Stephen King brand is probably the most well-recognized literary property out there. So it's always interesting to see King lend his attention to more obscure projects. Like Hard Case Crime, an imprint of paperback hardboiled crime novels. Including a mix of brand-new and classic 40s and 50s pulp crime stories, Hard Case Crime seemed like an interesting project. The star-power of King lending a novel to the imprint was an instant publicity-builder: a world-wide bestselling author trying his hand at a small publisher, in a genre outside of his traditional focus. But wait: can King actually write a hardboiled detective novel? The Colorado Kid answers that question: no. This is the worst excuse for a mystery you could possibly imagine. 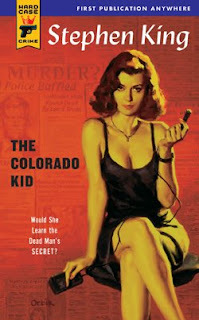 The premise is fantastic: a 22-year-old small-town newspaper intern digs into a 25-year old crime. A man is found dead on a Maine beach, with no identification. Turns out, he was from Colorado. But he'd been seen scant hours before, all the way across the country. He barely had time to charter a plane, drive at top speed to the beach and die before being discovered. So what happened? Spoiler: You never find out! King spends an entire novel mulling over the case, like a slackjawed Maine yokel with a mouth full of tobacco, before figuratively shrugging his shoulders and saying "I guess we'll never know." As means of explanation (or apology), King includes an afterword, essentially explaining that mysteries aren't really about solutions, they're about the investigation. Well, Mr. King, that's a load of horseshit. Mystery novels are all about the solution. The concept of a mystery novel is a suspenseful build-up to the reveal. The investigation is just a way to delay the single most important part of a mystery story: the solution. Don't read this book. Please. It's really, really terrible. Eldritch: At some point I'm going to write a positive book review. Really, honestly. But there are some books that demand to be held to account. Pseudonym: I had always wondered where Stephen King (and Tom Clancy) find the time to write 15 1200-page books a year. Though I haven't read a King book since... The Tommyknockers? (which was also pretty terrible), I see his work on store shelves all the time and think, "is this new, or just a reprint of an old one I hadn't heard of?" Nope. All New. How does he do it?? Weaselsnake. Saving you $5.99 one spoiler at a time. Your review made me laugh. And how about that cover? Which also had nothing at all to do with the story???!!! Thanks, Lourdes. I'm torn about the cover. I kind of love how it totally evokes that classic pulpy era. And if King had written a halfway-decent take on the hardboiled detective novel (even if he'd put a modern spin on it ), I think it'd be a perfect package. As is, it is definitely a jarringly incongruous cover for a sadly terrible book. Thanks for reading. If you need to know what happened to the Colorado Kid read the Dark Tower series. You should read up on how Stephen Kings novels tie into one another.